Much thanks to my friend Mandy for introducing me to this recipe. She is great at baking and her results inspire me a lot. You may see her recipe shared on Rasa Malaysia. This is the 7th cake I have been baked so far and 5 out of 7 were cracked even though I followed every instruction and tip. Finally, I think I’ve figured out the culprit. 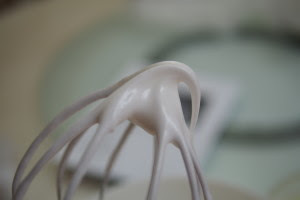 It is because of the meringue, whisk until soft peaks form only as below picture. Line the bottom of 8-inch round cake pan with parchment paper. 9-inch round cake will work too. Please wrap the base of the cake pan with 2 or 3 layers of aluminium foil if spring form round cake pan is used. Melt cream cheese, butter and milk over a double boiler. Cool the mixture. 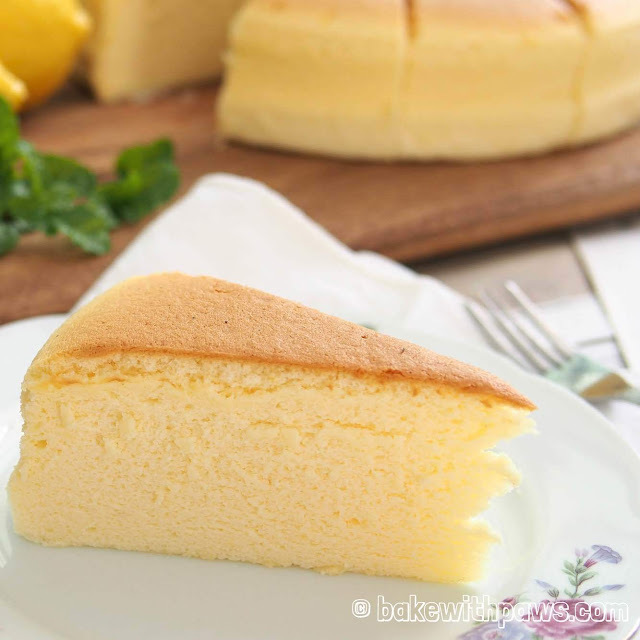 Transfer the cream cheese mixture to a bowl of stand mixer, add in lemon juice and egg yolk. Using the paddle attachment, beat the mixture until smooth. Sift all purposed, corn flour and salt. Fold in the flour mixture and mix well. In another bowl of stand mixture, whisk egg whites with cream of tartar until foamy. Add in the sugar and whisk until soft peaks form. Take 1/3 meringue and fold gently into the cream cheese mixture, then fold in another 1/3 of meringue. After incorporated, pour the batter back to the remaining 1/3 meringue and fold. Pour the mixture into the prepared cake pan. 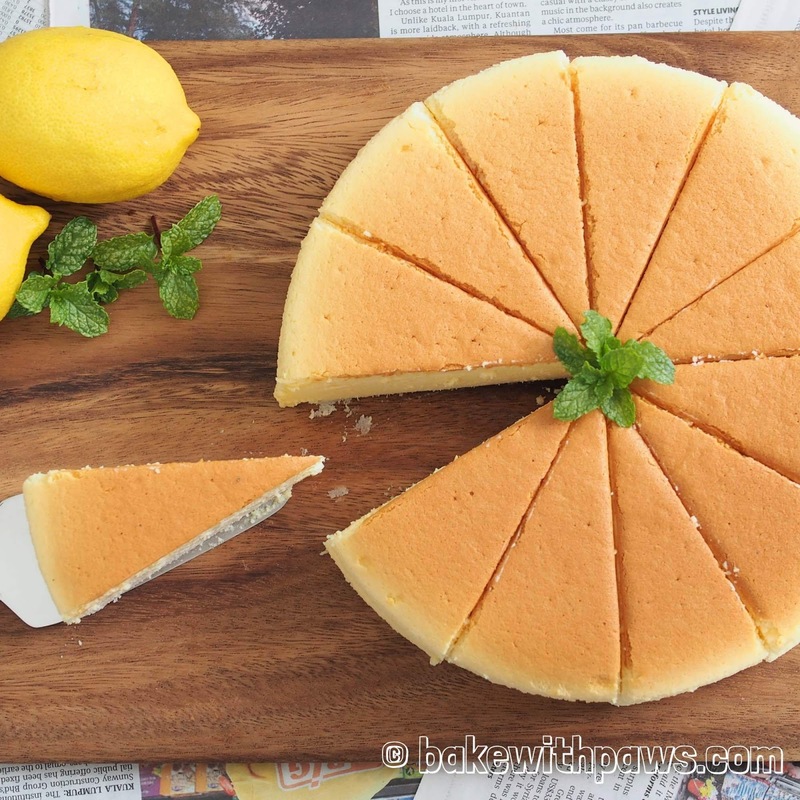 Bake cheesecake in a water bath for 1 hours 30 minutes or until set and golden brown at 150 degrees C (without fan mode). Leave the cake to cool down in the oven with the oven door open, about an hour. This is to prevent sudden change of temperature that may cause the cake to shrink drastically. Refrigerate the cake (with or without the cake tin) for at least 4 hours or overnight. I used 9-inch non-stick spring form round cake pan and lined the bottom with grease-proof baking paper or parchment paper. I also wrapped the base of the cake pan with 2 or 3 layers aluminium foil to prevent seepage. As you can see my cake is not tall because I used 9-inch round pan. Please use 8-inch round pan if you like your cake too be taller. I used hot water for the water bath.